The merging of technology into the wedding industry is not only unavoidable but totally necessary. There are so many companies/ online resources that help couples do practically everything from tracking the to do list, budget updates, vendor checklists and my personal favorite are all the new apps available for couples and guests. The resources I am featuring today are those that I have looked into and liked but have not used and I'm definitely not getting paid for advertising. Just some new, creative companies that I think are worth looking into on your wedding planning journey. Enjoy! #1. Upload Wedding Photos Live. Wedding Snap is such great resource. 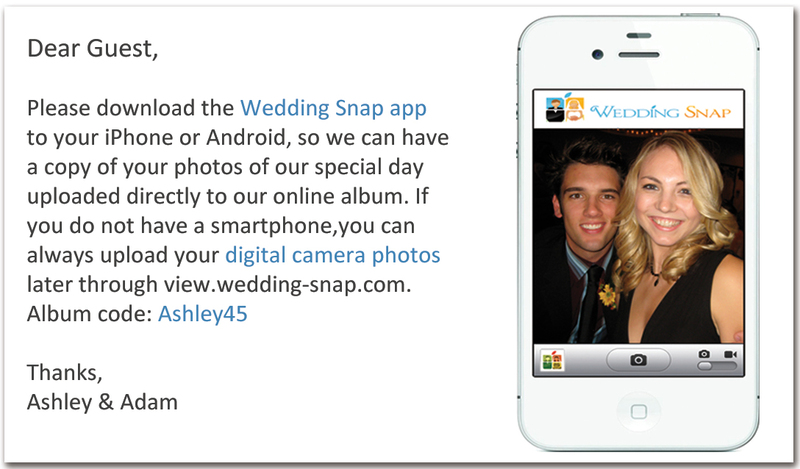 This company specializes in capturing and displaying all the photos your guests take on your wedding day. They offer a FREE app that guests can utilize to upload directly from their phones or they can upload easily from their cameras onto one central password protected site. While there are many photo album sites that already offer this service, this company is specifically wedding minded with the ability to upload a LIVE slide show as guest upload photos throughout the day. Plus there is unlimited room for photos up to a year which is very generous. #2. Wedsites Go Mobile. I'm sure that most of you have seen the new trend of couples creating wedding websites or 'wedsites' with all of the important info in one place. Some even offer the ability of RSVPing and choosing your meal on the wedsite which is not only super convenient but very cost effective to keep everything paperless. But technology is always striving to be even more convenient and now we have Appy Couple, a company specializing in creating wedsite apps. This is aimed at guests with smart phones who can upload your wedsite app and have all the information without going to an online website although there is a coordinating website for those without smartphones. This idea is already a HUGE hit with a waiting list of over 7,000! And with all the amenities, I'm not surprised- in addition to the typical services on a wedsite, Appy Couple offers an online registry in real time, wedding updates in real time, private messaging and the ability to upload photos to the app. #3. Share Your Love Story. I am pretty blown away by this next company, Twenty Pages. They specialize in creating one of a kind wedding magazines. You can feature your unique dating story, wedding party bio's and photos which Twenty Pages categorizes as the "fun stuff" as well as the "practical stuff" like wedding day information (date, time, location, directions, etc. ), registry information and the top ten things to do in the city for out of town guests. It is a fantastic keepsake that is only enhanced by a professional team of graphic designers and editors. However, this incredible item does have a hefty price, the Near & Dear Package is $690 and includes 20 magazines with each additional magazine priced at $12. And since I'm not being paid to advertize this company I can tell you if Twenty Pages is out of your price range, then next best thing would be to get some inspiration from TP then use your own software or hire a local graphic designer to save you some room in your budget. The app should have more features like wedding resources,rsvp etc and also the wedding app should be simple to use. It must reduce the time and work for the wedding people.